Last week, I did two things for the first time: baked a cake and went to Ministry of Testing’s TestBash conference. Both of them made me step out of my comfort zone and try out things I hadn’t done before. While the making of the cake was tasty, I am more excited about sharing my experience of TestBash Germany with you. It was the first time I’d been to a testing conference, so I didn’t know what to expect or how it was going to be. I had heard only good things about the MoT community, but somehow, I was never an active part of it, just reading articles and watching TestBash talks online on The Dojo. So, I was looking forward to meeting the community in person. 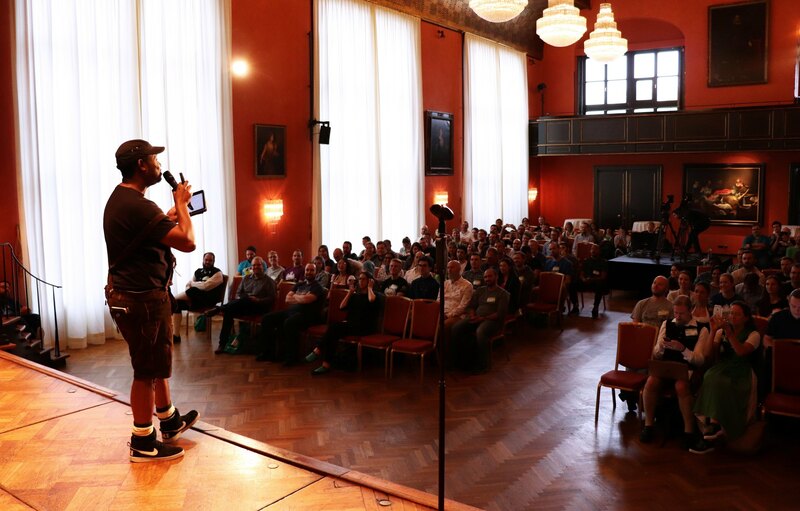 The location of TestBash Germany was at the Munich Künstlerhaus which translates to the Munich House of Artists. It is in the city centre of Munich and is a great venue, full of history, and was very well chosen. However, with the conference being on a Friday, after a working week, my mind was elsewhere. On route to the venue, I was still caught up in work topics and answering emails and struggled to find my way. So, when I eventually arrived, I was immediately surprised to see all these smiling people; networking, answering questions and preparing the start of the conference. There were a few familiar faces (colleagues from work, people I'd met before at local meetups), but mostly new faces. And, I must admit, I felt nervous and had feelings of imposter syndrome creeping in. Whilst trying to move past these feelings, the talks started. And instantly, I got captivated. The first talk “Doubt Builds Trust” by Elizabeth Zagroba, which is a topic that highly resonates with me, since in my job, our team problems were often based on a lack of trust, probably some issues still are. Additionally, I had a hard time building the team’s trust in me when I first started working there. Trust is always a sensitive topic. 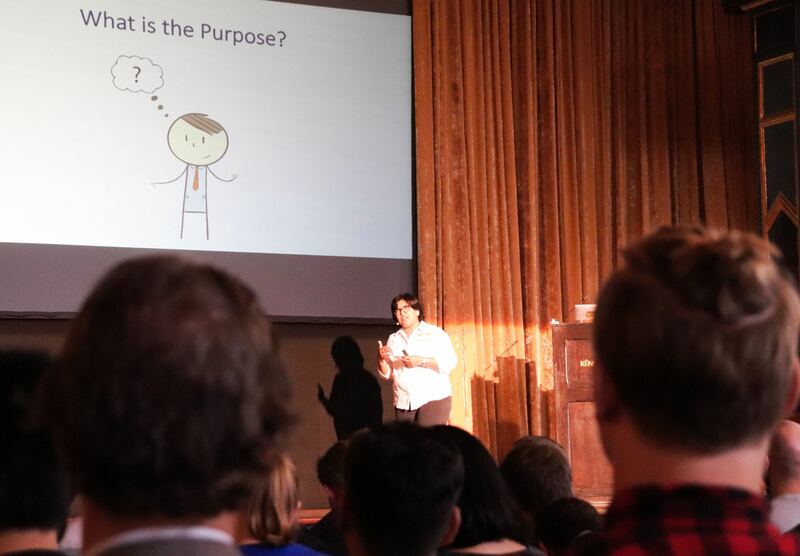 Ravneet Kaur’s talk “Testing for purpose” was also a very interesting talk for me. It focussed on the importance of having a culture of experimentation in your company and not being afraid to make mistakes. This talk was also advocating releasing in small chunks to smaller user groups to find out first if your idea was successful as opposed to big releases to all your customers. This idea, as well as A/B testing, came back in other talks too. All the talks were diverse and about different topics, from storytelling, to how philosophy can be applied to testing, and from testing role-playing games, to testing in production. However, they all came down to the same core values that are essential to software development and to an Agile team: trust, honesty, communication, having a purpose (you as an individual, your team, your product), company culture, and, also, in the end, a leap of faith and accepting risks. But, I will not spoil any more of the talks for you, which will appear soon on The Ministry of Testing’s learning platform The Dojo. After 3-4 talks, and still fighting my “I don’t belong here” feeling, I spontaneously, without much thought, decided to go up to Ash Coleman, the final speaker of the day, and say “Hi”. I was warmly welcomed and it was a great conversation about, guess what? Trust and culture. My favourite topics! When I was there, trying to share things from my experiences, I felt so nervous, was blushing and barely finding my words. However, afterwards, I felt great for having overcome my feelings. Having the chance to talk to different people and exchange experiences was one of the things I like the most about TestBash. Also, another highlight; we had cotton candy, which made everyone remember childhood. However, my favourite thing about TestBash was the 99-second talks. These talks happen at the end of the conference and anyone at TestBash can talk for 99-seconds about any topic they choose. During the 99-second talks, I literally got goosebumps and felt that I was a part of an awesome community. Each of the talks seemed so spontaneous and heartfelt, and each of them had an important message. I felt happy and lucky to have been there, to experience it: the conference, the talks, the people, the energy, the kindness. All of it. You’re in a continuous process of learning and improving yourself. Courage is all it takes to open yourself up to new experiences, new learnings, new mistakes even, courage to go say Hi, courage to go up the stage and tell your story. While you’re at it, remain honest and true about yourself and who you are. Trust yourself and also be prepared to take risks in trusting the people around you. MoT is all about community and giving back to the community, with awesome people that you always learn something from (yes, again learning). And, great things happen when you step out of your comfort zone! Since TestBash Germany, I am more confident in myself, in my skills, but also my ability to say “Hi” to new people. I’ve learnt to take a leap of faith and trust that good things come when you try something you have never done before. When speaking about testing, I’ve learnt that, if I become a better tester, I will bring more value to my team, and therefore, I will also feel more accomplished as a person, a better version of myself. Elena, 27 years old, Agile Tester at XING Events GmbH in Munich, Germany. Originally from Romania, moved to Germany almost 3 years ago. She has around 5 years experience as a tester, both in Romania and in Germany, working in different teams; everything from a feature-development team to being the QA in a DevOps team. Elena is passionate about testing and Agile in general, loves what she does, and loves topics such as culture and trust. You can connect with Elena and find out more about her on Twitter, LinkedIn and her XING profile.